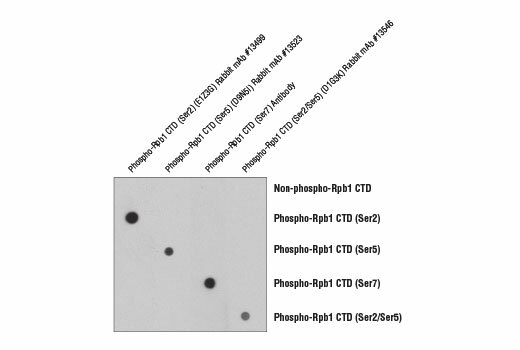 Peptide dot blot analysis demonstrating Phospho-Rpb1 CTD (Ser2/Ser5) (D1G3K) Rabbit mAb specificity. 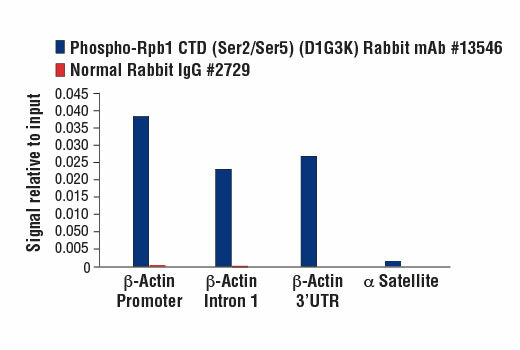 Antibody binding to pre-coated Rpb1 CTD peptides is shown using Phospho-Rpb1 CTD (Ser2) (E1Z3G) Rabbit mAb #13499, Phospho-Rpb1 CTD (Ser5) (D9N5I) Rabbit mAb #13523, a phospho-Rpb1 CTD (Ser7) antibody, and Phospho-Rpb1 CTD (Ser2/Ser5) (D1G3K) Rabbit mAb. 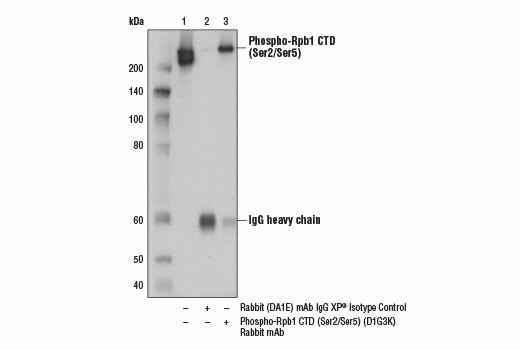 As expected, Phospho-Rpb1 CTD (Ser2/Ser5) (D1G3K) Rabbit mAb only binds to phospho-Rpb1 CTD peptide when phosphorylated at both Ser2 and Ser5. 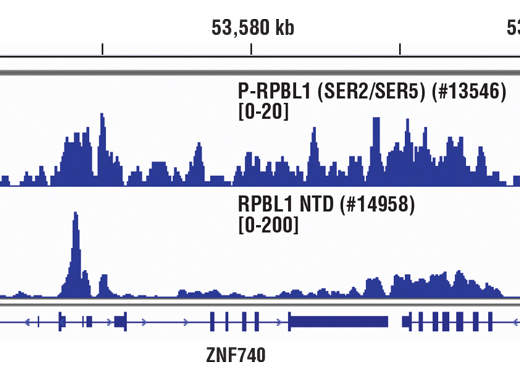 Phospho-Rpb1 CTD (Ser2/Ser5) (D1G3K) Rabbit mAb recognizes endogenous levels of Rpb1 only when the carboxy-terminal domain (CTD) heptapeptide repeat [Tyr1, Ser2, Pro3, Thr4, Ser5, Pro6, Ser7] is dually phosphorylated at Ser2 and Ser5. 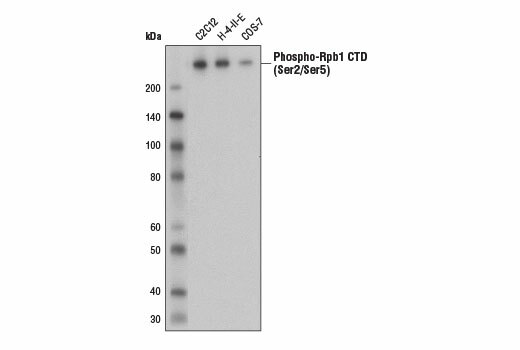 This antibody does not cross-react with Rpb1 CTD that is singly phosphorylated at Ser2, Ser5, or Ser7. Monoclonal antibody is produced by immunizing animals with a synthetic phosphopeptide corresponding to residues surrounding Ser2/Ser5 of the human Rpb1 CTD heptapeptide repeat.